Taking care of your family is a job that every head of household loves to do—but sometimes you need help from a professional. This is especially true when it comes to health care, specifically with you and your loved one’s smiles. That’s why its so important to Generations Dental Care to provide a family dentist in Concord that serve every one of your friends and family’s dental care needs. At Generations Dental Care, we want you and your loved one’s smile to be the those of your dreams, but first you have to make sure that your teeth and gums are in good health. Many don’t realize that without a smile in good health, they’ll never be able to maintain aesthetically pleasing results. When you visit our office, you’ll benefit from a variety of dental treatments and procedures that are specifically to address any and all of your family’s dental concerns. The following treatments are what you can expect from our expert dental team. The foundation of a strong smile starts with consistent preventive care both at home and with your dentist. That means brushing for two minutes, twice a day from your house. You should also be making sure your whole family is flossing every single day. Finally, it’s important that every member of your family schedules and keeps all of their regular dental checkup and cleaning appointments with our local dentist. Why? These appointments give your dentist an opportunity for your dentist to keep an eye out for any and all dental problems. Plus, your dentist will have the opportunity to remove pesky dental plaque and harmful tartar from the crevices of your smile. Patients of all ages should undergo a checkup and cleaning every six months, but if you’re a high-risk patient, you should visit more often. Be sure to discuss this with your dentist! Excellent dental care starts at a young age, which is why we believe in treating even the youngest members of your family. It’s important to bring your children in for quality dental care so that they become familiar with their dentist and can continue receiving the oral health care they will need in the future for generations to come! 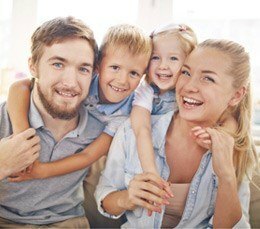 You can increase convenience and improve your family’s dental health by picking a local dentist that is here to serve all of your family’s needs. Whether you just want to keep your smile clean, improve its aesthetics, or take your little one in to evaluate a loose tooth, Generations Dental Care is here for you and your loved ones. Call us today to schedule your next visit.